It really is ‘touch and go’ at CLO Wine Bar. When I was in NYC this week, I stopped by the bar, located in the Time Warner Center at Columbus Circle. When you walk in, you are greeted by a friendly host who explains how to locate a wine on their unique menu system. 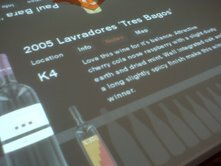 You hold your hand over the table and a menu screen appears and you use gestures to navigate through over 100 wines available. The display gives you all the information you need about each wine such as producer, region, grape, vintage, price, tasting notes and bottle location in the bar. Once you pick your wine, you walk over to the machine, insert your card and voila! Every wine (except sparking) is hooked up to an Enomatic machine and gives you an exact 4 ounce pour of the wine of your choice…just make sure your glass is underneath the spout. Then you can go back to your seat and enjoy your wine. There is a small menu available to enjoy a cheese plate or charcuterie with your wine. I thought the concept for this place was great, but I was hoping for 1 or 2 oz pours to allow for an opportunity to taste more wines. Trust me, after a few 4 ounce pours, they will all start to taste the same. Not only that, but your bill could be well over $100 for wine samples alone. Now, if you ever wanted to try a glass of Krug champagne or Opus One without splurging on an entire bottle, then here is your opportunity! This entry was posted in General Wine Information, Links, restaurants, wine & cheese, Wine Regions. Bookmark the permalink.